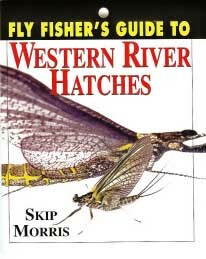 Fly Fishers Guide to Western River Hatches—this little streamside handbook gets straight to the point—only the important information about successfully fishing the mayfly, caddisfly, stonefly, and midge hatches of western trout rivers are here. 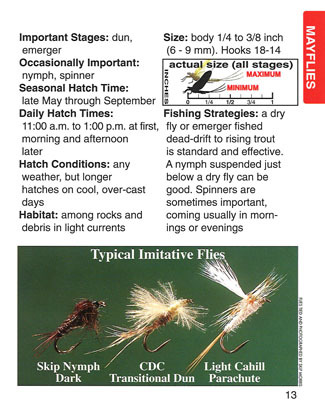 You'll understand when and where to find each hatch, what flies work for it and how to fish them. There is a seasonal chart showing when the various insects hatch. All this in a book that fits in a normal chest pocket. Top left: photographs of real insects along with accurate illustrations and details for identification. 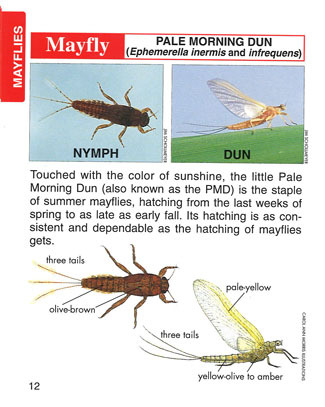 Top right: critical information on when, where, and how the insect hatches; how to effectively fish the hatch; and samples of imitative flies. 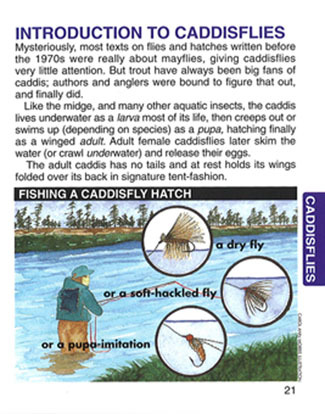 Right: an introduction for each insect-group includes fishing techniques.